According to a joint resolution, the memorial will be constructed in Area I, which surrounds the National Mall in Washington, D.C. , reports Architect magazine. On March 31, President Donald Trump signed into law a joint resolution sponsored by Sen. John Boozman (R-Ark.) approving the location of a public memorial commemorating the Gulf War’s Operation Desert Storm and Operation Desert Shield in Area I, an area that surrounds the National Mall in Washington D.C. 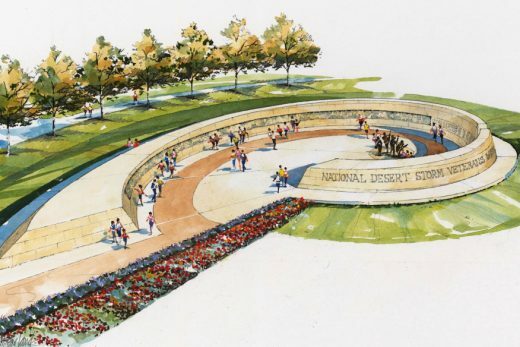 Though no specific site had been selected, renderings of the National Desert Storm Veterans War Memorial were published in 2013 without a design competition or invitation process (which is not required by law). Operations Desert Storm and Shield took place between August 1990 and February 1991 in response to Iraqi president Saddam Hussein’s invasion and annexation of Kuwait. President George H.W. Bush assembled a coalition of 34 nations, including the United States, who sent troops to neighboring Saudi Arabia. Ultimately, more than 900,000 troops were deployed to the region, and after a 100-hour ground attack on Feb. 24, the United States declared Kuwait liberated. The National Desert Storm Veterans War Memorial is the result of a collaboration between the board of directors of the nonprofit National Desert Storm War Memorial Association (NDSWMA), which is spearheaded by CEO and president Scott Stump, “numerous veterans of war” according to the memorial’s website, and Indianapolis–based firms CSO Architects and Context Design landscape architecture. The memorial will comprise a coiled wall that will be constructed from Kuwaiti limestone, which will culminate at an “inner sanctum” where the names of the 383 service men and women who lost their lives will be inscribed. A 150-foot bas-relief will depict significant events from the operation. Many of the design elements were determined with input from online surveys completed by hundreds of veterans, including the curved footprint meant to evoke the “left hook” military maneuver which hastened the end of the conflict. 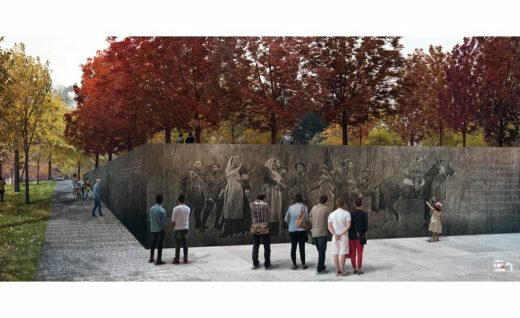 The NDSWMA opted against hosting a design competition for the memorial, citing poor returns experienced by other memorial design competitions, and instead took the advice of an “AIA leader” and began working directly with CSO Architects, who worked pro bono for the first two years on the project. Citing a need for imagery to generate interest for the project, the NDSWMA—then an informal grassroots group—sought out a firm with veteran ties and connected with CSO’s Tim Jeffers, a former public affairs officer who served under Lt. Gen. David Petraeus. A 20-month research and design process ensued, under the lead of CSO principal Randy Schumacher, AIA, resulting in multiple memorial designs intended for various possible locations around the National Mall. The published renderings depict what Schumacher calls “a preliminary design” for one of the specific sites—which one he declined to name—that may ultimately need to be “modified for the (actual) site, or reconceived.” While it is unorthodox to have designed the memorial in advance of the final site being selected, Stump is optimistic that the scheme will need little alteration. He hopes construction can begin by 2018 and be completed before the end of 2019. Now that approval for the general memorial location somewhere within Area I has been signed into law, the memorial sponsors must now secure an estimated $25 million funding from private sources. 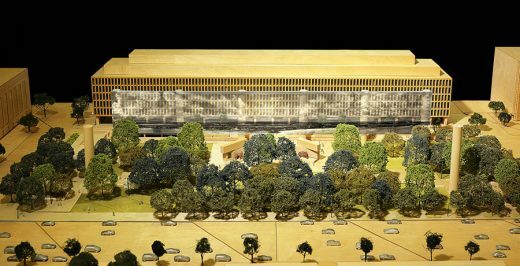 The NDSWMA does have a site in mind, an available parcel on 23rd Street NW and Constitution Avenue, adjacent to the Vietnam Veterans Memorial. 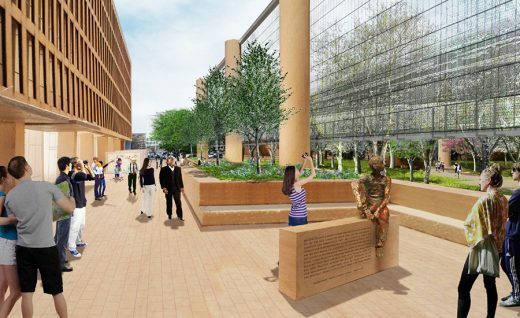 Renderings Released of Frank Gehry and AECOM’s Revised Eisenhower Memorial. The Weight of Sacrifice Memorial in Washington, D.C.
Website: Eisenhower Memorial Washington, D.C.